With the Club House and Church steeple in sight this hole can cause problems from nowhere. The tee provides a clear view of the required shot to a well defined fairway. Trees down both sides of this fairway will punish the wayward tee shot; the left masking the out of bounds, the right resulting more ofter than not in a severe penalty. A fairway bunker will also pick up shots to the left side of the fairway. 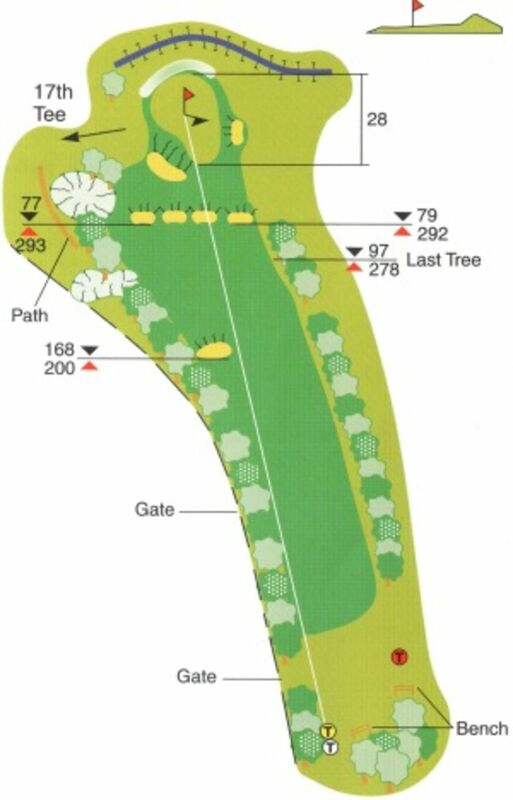 There are four cross bunkers in a line some way down the fairway, hiding the change in levels, where the land runs gradually away through the green. A large bunker protects approaches from the left or misdirected approaches from the right; its steep face providing a formidable hazard. To the left of the green is a bunker positioned to attract, and it does, shots that are not directed to the heart of the green. The green slopes from front to back, so judgement of distance is paramount. The back of green has a small bank over which the land runs to the stream. A challenging green to putt on especially considering speed and break.